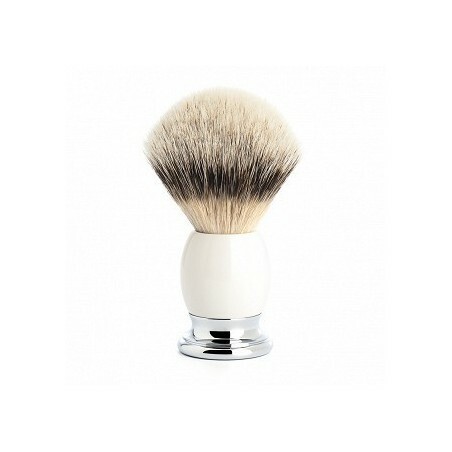 Mühle Sophist Shaving Brush Silvertip. 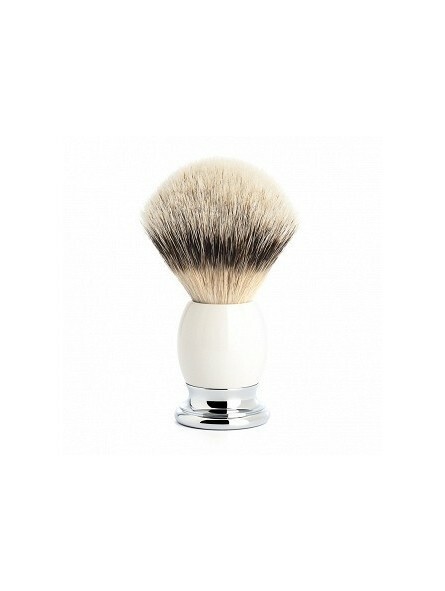 SOPHIST collection is regarded as a design classic which symbolises the archetype of traditional shaving culture. Connoisseurs love the harmonious combination of classic form and the best materials. Only the solid horn tips are processed into handle models made of buffalo horn. Grenadilla wood is also used to make fine musical instruments. Porcelain, the white gold of China, has been a cultural commodity since time immemorial. Silvertip badger - Natural hair, the finest material for handcrafted brushes. Its special features are the shimmering silver colour and a black band running through the hair. It is used to make durable, high-quality, unique pieces with outstanding performance qualities.. Handle - Porcelain combines fine elegance with great hardness and is a centuries-old cultural commodity. Individual colouring and sheen are only obtained after the second firing process: glazing. Delivered with a exclusive gift case by Mühle.